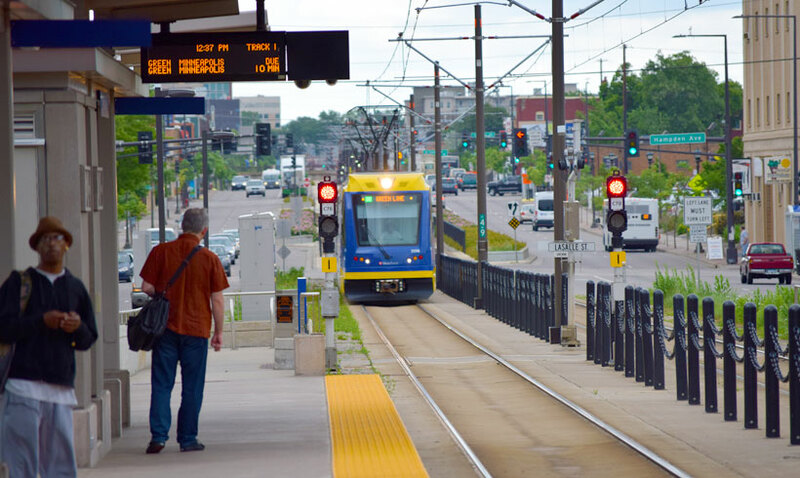 From creating a campaign designed to make streets safer for pedestrians to revamping a college’s transportation policy to put sustainable transportation at the forefront, the Twin Cities community has been busy improving commuter mobility in Minneapolis and St. Paul. 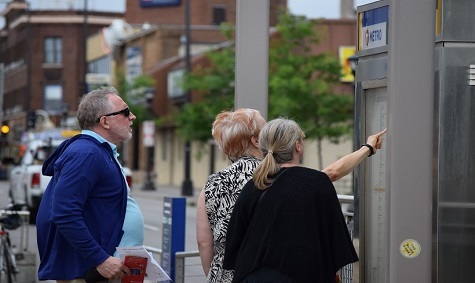 In recognition of this hard work, Metro Transit hosts the Commuter Choice Awards each year to acknowledge the community members and organizations work to make these projects possible. This year’s Commuter Choice Awards were held on Wednesday, April 26th at 514 Event Studio in Minneapolis. Nominees gathered to celebrate the winners and learn about unique approaches being taken to redefine commuter mobility. There were six different award categories: Building Management/Owner, Commuter Benefits Coordinator, Employer, Government Entity, Individual/Commuter Champion, and Organization. These categories recognize the extraordinary kinds of work being done to support sustainable transportation across various sectors. Augsburg College won the Employer category for their work promoting multimodal transportation options among their faculty, staff, and students. After a major construction project created a loss of parking spaces, Augsburg’s Transportation Task Force re-evaluated its policies. A new transportation plan supports and encourages sustainable transportation and also supports Augsburg’s mission and commitments to environmental stewardship and as an urban institution. The holistic approach to encouraging sustainable transportation includes further subsidizing bus passes for faculty, staff, and students; enhancing car sharing and carpooling programs; discounting Nice Ride memberships; boosting parking prices for commuters who drive alone; and establishing an incentive “combo pack” that allows people to alternate between driving and commuting by transit. Recognizing that uncertainty about changing long-standing habits that would threaten the success of the program, Augsburg also created a transportation section of its website to foster awareness and support of the plan. Augsburg partnered with St. Paul Smart Trips & Transit for Livable Communities to familiarize faculty and staff with different forms of transportation. During the summer of 2016, several hands-on events taught Augsburg staff about the bus and light rail, Nice Ride bike share, and other options. The Stop for Me campaign was the winner in the Government Entity category. The innovative program was a yearlong collaboration between St. Paul’s 17 district councils, St. Paul Smart Trips, and the St. Paul Police to improve pedestrian safety. Stop for Me encouraged pedestrians and drivers to be more aware at intersections, crosswalks, and parking lots; educated drivers about how stopping for pedestrians is both common courtesy and the law; and enforced that law when necessary. 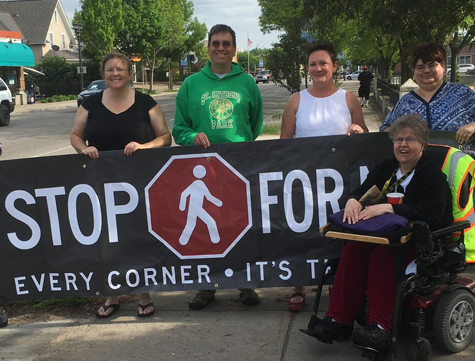 In 2016, Stop for Me held 60 crosswalk events in every single district of St. Paul. Volunteers repeatedly crossed at intersections and on-hand police officers gave citations and warnings to drivers who failed to stop and allow pedestrians to cross. The first year of the Stop for Me campaign helped educate both pedestrians and drivers about pedestrian safety. Both organizations embody the spirit of the Commuter Choice Awards. They both succeeded in creating programs that improved the mobility and safety of their communities. To learn about the other winners of this year’s awards, read Metro Transit’s recap of the event. Congratulations to the winners and honorable mentions of the 2017 Commuter Choice Awards!